When Max created the Metal Rider back, the first one in the TEXTURE SERIES, he wanted everyone could enjoy it. Planned to be a 2500 print run, it ended being a 5500 print run due to the high demand. The deck is completely sold out. Max wanted to print still, but being the first printed in numbered edition, he preferred to keep the deck as a limited edition. Max decided to create another edition keeping the same essence of the original but doing some changes. The METAL DECK is a reinterpretation of the classic Bicycle RIDER BACK deck using a set of textures to give the cards a real metal aspect. 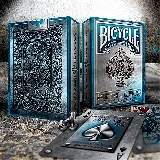 The BLUE EDITION of the METAL RIDER BACK DECK has the same cards as the original, although the color accents in the back, ace of spades and tuck case are blue. This new blue color fits much better with the court cards color scheme. The numbered cards have that awesome metal customization of the original deck. For those lucky backers and customers that already own the original deck, this one will give them some extra features: A new blue ace of spades. A new blue back. A new joker revelation. A new tuck case revelation. A new unlimited seal. The tuck case will be as impressive as the original, with a fantastic silver foil stock and deep debossed details. Main features of the deck are: Printed by the United States Playing Card Company. Bicycle stock and Magic (air-cushion) finish. Customized faces with metal theme. Customized classic rider back in blue metal. Silver foiled and de-bossed tuck case. Max is a collector and a magic enthusiast so the METAL DECK has been designed as a collectable item but thinking of magicians and card routines. For that reason, it has many features that allow magic tricks with only the deck or combining it with other rider back decks Subtle one way cards with a two ways aspect. Joker reveal. Card reveal on tuck box. Double back gaff card. Motion feature on corner screws. • The cards are poker size.